I make no secret of the fact I am a massive fan of Avon. It's no coincidence that Avon has been selling beauty products under the brand name since 1939. Their constant innovation and quality ingredients have built a level of trust with the general public that has really stood the test of time. I grew up with it, and it is still the only brand I turn to for certain products, such as the AMAZING Clinical Eyelift, which is so much cheaper than other eyelift products and is so effective. It's great to have a product that you can use on the eyelid, especially as I get dry skin on my eyes, so I find it really soothing. It works, too, I always look more awake after I've used it. It is half price in the current catalogue, so it's a great time to invest in a pot! 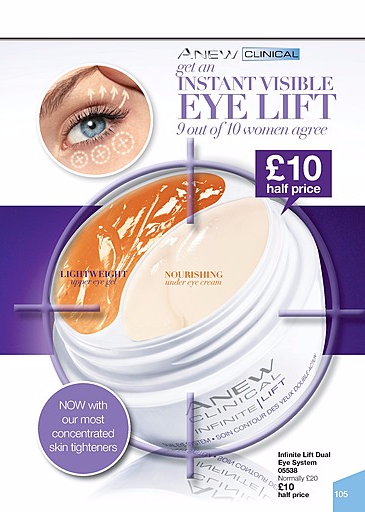 Over the years, Avon have branched out way beyond skincare and beauty. They stock an impressive range of clothes, including fitness wear, nightwear and lingerie, as well as beautiful watches and jewellery, including lovely designer brands. They cater for children too, with their own character merchandise and toys too. One of Avon's most iconic brands is Skin So Soft, and an enduring favourite from the range is Dry Oil Spray. Available in Original, Fast Hydration or Silky Moisture, there are five of these versatile wonder products sold every minute. Just how versatile is it though? Most people who use it will have discovered a plethora of beauty uses from this one little bottle, but there are a wealth of other applications for it too. Everyone loves a good life hack, so I've added the full list of eighty five different uses for Skin So Soft Dry Oil Spray below. It’s a bath oil and after shower moisturiser. It can be used to remove makeup. Great tanning oil (no sunscreen). Hot Oil treatment, to soften cuticles. Great massage oil for tired muscles. Cleans tape marks from the skin. Cleans ink off the skin. Helps relieve itching caused by dry skin. Helps retain elasticity. Use to remove paint from the hands (instead of turps). Cleans oil and grease off the skin. Rub hands with it before washing, it helps get them cleaner. Rub on dry, cracked skin…helps heal skin in 2-3 days. Put 1-2 capfuls in liquid soap and use when shaving legs and underarms. Helps razor glide and leaves skin feeling smooth. Pour a little into your foot spa to help moisturise your feet while you relax them. It removes chewing gum from hair, skin and most non porous surfaces. Works great on head lice. Saturate hair and let is set for 15 minutes then rinse. You will need to shampoo a couple of times to remove the oil, but the lice will be gone and will stay gone. Wash hair as normal and after it dries use a small amount of skin so soft and rub into your hair. It goes straight in and leaves hair shiny with no greasiness. It clears mild cases of psoriasis. Sponge it around doors and windows to keep crawling insects out. Cleans permanent ink off stamps. It’s a good wood cleaner and conditioner for natural wood. It removes glue and gum left from price tags and labels from glass, metal and most plastics. It removes soap scum from shower doors, screens and curtains, and bathroom and kitchen fixtures. It removes lime and hard water deposits from fixtures, tiles, shower doors and windows. It’s an oil lubricant for fitting pipe joints that won’t slip together. It cleans ink of most vinyl and painted surfaces. It cleans heavy oil and grease from non porous surfaces. Use on curtain tracks to help your curtains glide with ease. It takes fur off clothing. Rub on brass ornaments and figures to keep them turning dark. Wash cupboards with it mixed in your cleaning water to keep ants off and out of your cupboards. Use it to discourage hornets and wasps from building their nests. After removing the nest keep the area sprayed with SSS, they won’t rebuild there. Use it to clean leather, it will also keep it soft and supple. Use on your air conditioner screen (filter), your incoming air will smells fresher and the screen will be easier to clean. Rub over all windowsills to keep ants out. It cleans paintbrushes easily and leaves them as soft as new. It removes gum from carpets. It removes scuff marks from patent leather shoes. Use on running rails on sliding glass door and windows. It removes ‘ring around the collar’. It removes liquid nail (panelling glue). Two glass bowls stuck together? Drizzle SSS down the sides and they’ll come apart easily. It removes candle wax from furniture, carpets and clothing. Spray on rose bushes and flowers to stop deer and other animals from eating them. Also works on flowers left in cemeteries. It’s a great furniture polish. Spray on your back yard to cut down on ants and other creepy crawlies. It cuts grease and cleans dirt from range cookers and cooker hoods. Add a capful to wash water of clothes… acts as a fabric softener and keeps bugs off clothes. Spray on orchids and other flowers for moisture and to keep bugs away. Cleans baseball caps, just spray on and rub with a toothbrush. Use one part SSS and two parts water and spray on tomato plants to keep tomato worms off. Put a little in your mopping water to keep crawling bugs out. Not too much or your floor will be slippery. Use in oil burners for a fresh smell and to deter flying insects. Removes crayon from most surfaces. It kills earwigs instantly, great for people with caravans. If you make candles, use clear wax and put SSS in it and garden, great for outside in the summer, no mosquitoes! As a deodoriser, spray into the air and let settle, it kills those nasty pet odours. If your child wets the bed, spray the bedding and sheets before washing it will leave a fresh clean smell. It’s a great insect repellent for your pet. (As recommended in ‘Outdoor Life’ and ‘Field and Stream’. Mix 5 parts water, 1 part SSS and mist on animals. Brushing it in makes their coats gleam and keeps insects off so the animals don’t fidget in the show ring. Mix in your pet’s bath water. It takes the fleas off them… and in between spray with the above to help keep them off. Rub on your hands before and after working with pets and farm animals. It will remove the strong smells. For dogs with dry skin mix one tablespoon of SSS with a gallon of water and use as an after bath rinse. Alternatively spray your pets coat once a week. To remove tar or asphalt from a dogs feet, rub on SSS and wipe off. SSS can be used as a hoof polish. This will put a nice shine on the hoof without drying it. SSS can be used as a muzzle, eye and ear enhancer. It works great and keeps the bugs away. Use mixed with water to mist your horses in the hot weather, it keeps away the bugs and keeps their coats shiny. Spray onto barn and dog kennel walls to deter flies and insects and to keep them smelling fresh. Sponge horses with Sweet Itch or other allergies with a capful of SSS mixed with 5 gallons of water. It stops the itching and leaves the coat soft and shiny. Use Skin So Soft when braiding horses manes. It holds the braids better and they don’t try to rub them out. It removes tar spots from the car without damaging the paint. Use to clean vinyl and leather dashboards, seats and tops. It not only cleans but also keeps it soft and prevents any cracking. After washing your car use as a tyre dressing to keep them looking new. Put some SSS on a small cloth and leave in your car to keep it smelling fresh and clean. Wipe down surfaces in the car to clean and eliminate smells left by cigarette smoke. Cleans oil and grease from hands, great for mechanics. It removes tree and insect residue from paintwork. Prior to travelling, rub SSS on headlights and grill. It makes insects and bugs easier to remove. If you don't have a representative who comes to your door, or are just a bit antisocial, like me, it is still possible to take advantage of the great bargains and cutting-edge products Avon has to offer. Online representatives, such as Lisa Marie, offer home delivery within their local area (in this case, Peterborough) or she will refund the online delivery charge on orders over £30 if you are further away. If you provide your email address, she will deliver an environmentally-friendly ebrochure to your inbox every few weeks, with no obligation to buy. You can pay online too, so you don't have to remember to have cash in the house when your delivery is due! Avon Dry Oil Spray is also available from Amazon.co.uk, and if you buy through the link, I get a small commission at no cost to you. The kids colour changing shoes. I love the Little Black Dress perfume. The Foot Works Beautiful Exfoliating Bar Soap! My feet need it! I've heard that special forces soldiers use this skin so soft stuff as it is such a good insect repellent! The brochure wouldn't appear for me (maybe it is my browser?) but I was looking through my mums brochure this week and we really want some more of the crackling foot stuff, it cools your feet down but it's all crackly too! I would most like to buy the dry oil after learning that it has so many uses I didn't know about. Also the foundation because it sounds like very good value. Big and Daring Volume Mascara. Daring volume mascara looks good! I'd like the Anew complete renewal cream. I wouldn't mind trying the Skin So Soft and testing a few of the uses. Definitely the Skin So soft - that list, and their special price at the moment is amazing!